Grad students! 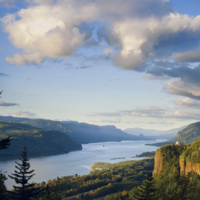 Join us for a full day exploring the beautiful Columbia Gorge; we'll tour the Bonneville Dam and visit the Fish Hatchery, have lunch at the Multnomah Falls Lodge, and go up to Vista House at Crown Point for one of the best views in the whole state! Hi everyone, the event is sold out as of January 29.
where I can buy the tickets? Also I'd like to bring my family together, is it ok? what if I don`t have a ride vehicle?